A few weeks later, after deer season was over, curiosity got the better of us. 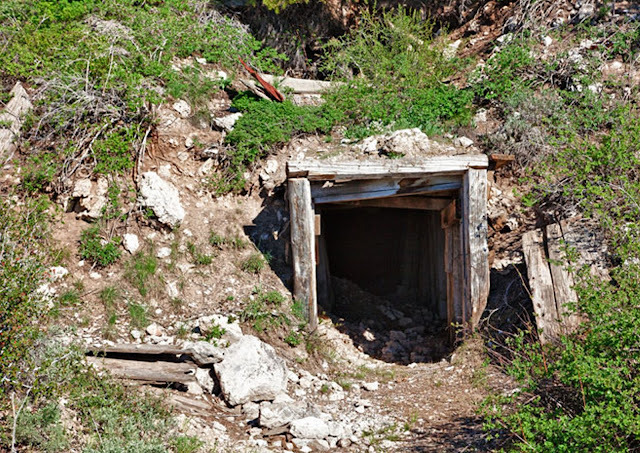 The discoverers of the Steamboat Mine didn't just claw their way to the top of the mountain and start pulling out gold. They, like the hundreds (or thousands) of others in the area, were following a trail of breadcrumbs in hopes of finding the mother lode. We'd already worked the south side of the mountain below "Steamboat City" to death. We'd located the cemetery for the town, as well as the mountains of rock piles and hydraulic debris left behind by the floating dredges and the monitors. Whatever had once been, had been obliterated by Depression Era mining. Gopher holes tunneled into the base of the mountain on each side of the creek increased in number as we continued to head upstream; as did the amount of hand stack piles. Yep, there'd been miners here in the 1860's; and lots of them! My old trusty Garret ADSII was getting a heckuva workout. 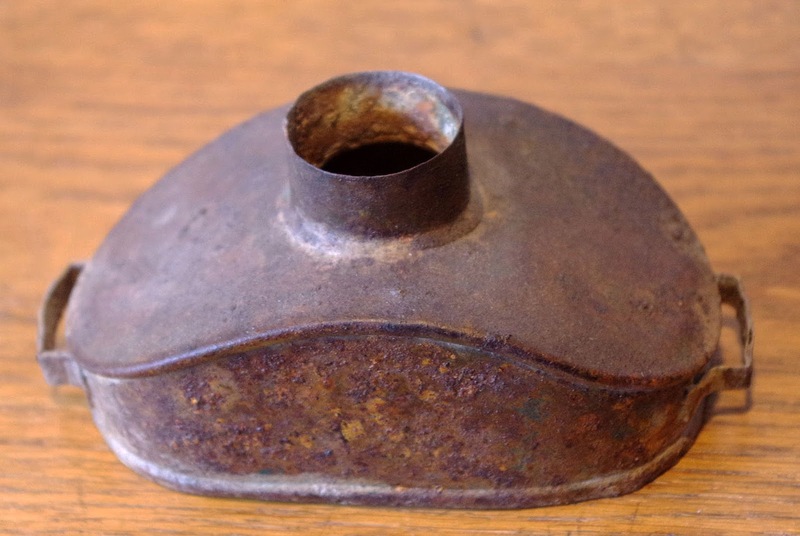 Mule shoes, ox shoes, cans, hunks of rusty metal; you name it, Mr. Metal Detector was finding it. The absence of square nails either in the creek bed, or on the raised benches above the creek, indicated scattered, transient occupation. Pitch your tent, pan a bit, prospect, dig a coyote hole or two, and move on seemed to be the order of the day. About three miles upstream a good size tunnel revealed itself on the south side of the creek. Just past the tunnel was a large, deep, steep canyon heading uphill, also on the south. To the right (north) a huge flat bench above the creek began to spread out. The amount of hand stacking present was mind boggling! And so was the quantity of square nails present. I'd never heard of "Brush Creek City", but if there was one, this may well have been "it". Tent and cabin sites were evident everywhere. This was well before the days of laptops, hand held GPS, and all the modern conveniences; but a compass, topo map, and a general guess about how far in we'd hiked seemed to put us directly below the Steamboat Pocket which should have been located about a mile up the draw (seemingly straight up). Turns out, it was. And this was ground zero of the initial discovery leading to the bonanza that they'd found above. 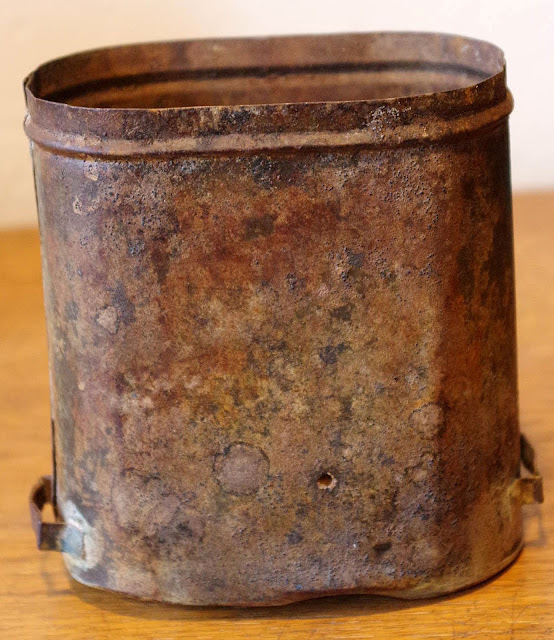 There's just something about exploring a gold rush era site that makes the back of your neck tingle. Those who've done it can relate! And the more we explored this site, the more I tingled. Just after taking a lunch break, I decided to try my luck at nugget shooting. Yeh, as if I was going to find a chunk of gold in one of the tailing piles that had managed to slip by the original prospectors... Much to my surprise, a few minutes later, the detector went off. Not just a faint signal though, more like a car was buried in this 8' high mound of round rocks. A half hour later and about three feet in, out popped the culprit. Gold?! Nope, a weird looking piece of metal that had been soldered together. One thing was for certain, it was old; Real Old! Into my backpack it went. I'd be glad I saved it. The rest of the day was spent detecting and pulling up oxen shoes, mule shoes, cans, metal "stuff" and busted up bottles ranging from the 1860's through the 80's. 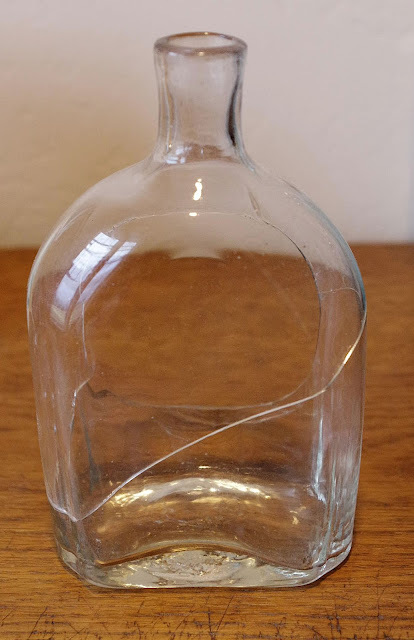 An aqua neck with a glop whiskey top was one of the dug shards that gets one excited. Chalmers? Gold Dust? Tea Kettle? Or was it just a Lewis Hess / Damiana Bitters... We'll never know as the rest of it escaped discovery~. Between flooding, snow drifts and months long permafrost in the winter, it's not surprising that everything was splattered. 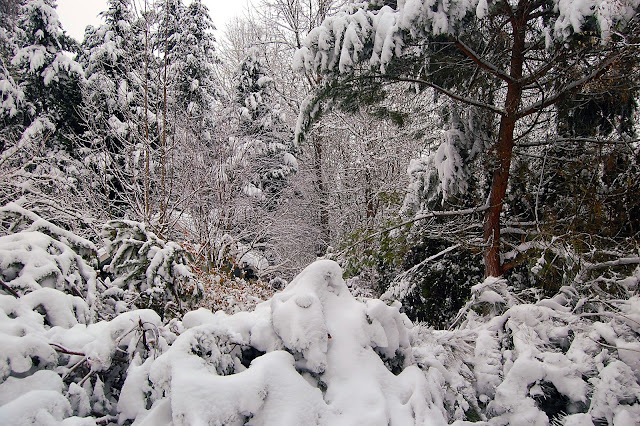 Still, it was a blast, and we'd discovered an area that hadn't been pounded by every digger in the area. That evening I realized that I'd gotten sidetracked when I discovered that mystery hunk of metal in the first tailing pile. 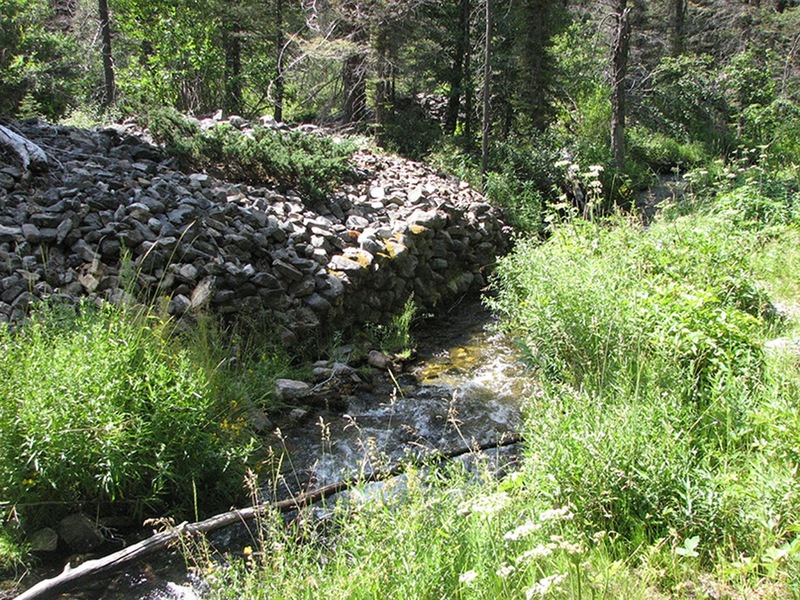 I'd immediately taken the "thing" down to the creek, washed it, and continued on upstream with tools and detector. What if that loud signal had been gold and the metal thing had just been there by coincidence? Solving the mystery would have to wait, as it was now late November and the winter snows had started to pile up in that deep dark canyon. The snow drifts in the deep canyons of the Applegate drainage are tenacious, often lingering well into May. This year was no different. Finally, around the middle of the month, we decided to head back. Only scattered patches of snow remained and the creek was running clear and cold. I've always been like a homing pigeon when it comes to revisiting spots. Once I've been there, I can inevitably find my way back. And so, this particular morning found me making my way back to the hand stacked pile of boulders where I'd found the "whatzit". My Garrett went wild on the tailing pile the second I switched it on. Sure enough, there was more to be found in the same spot as I'd been the autumn before. Another foot in and I located what was driving Mr. Metal Detector nuts. Gold? Nope... It was another piece of metal. I carefully pulled it out. Low and behold, it was the other half of the "thing" I'd dug the previous year. Imagine my surprise though, when I continued moving rocks, and the mouth of a sheared and refired lip made it's appearance. A bottle! 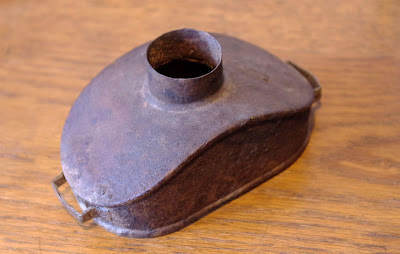 Not just any bottle though; it turned out to be an open pontiled flask, wrapped in wool cloth. Elation was once again short lived as it, like the Jockey Club, had succumbed to the elements. But, most of it was there. It was then that I pictured the other metal half in my mind's eye. Mystery solved, it was a canteen! 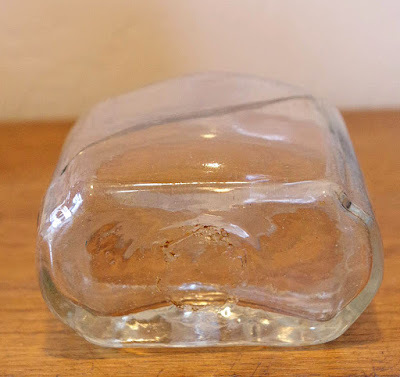 Once home with my finds, I put both metal halves in warm ammonia water to soak and then began to clean it with a soft toothbrush. Slowly, as if my magic, paint began to appear from beneath the rust as I worked my way up from the base. Blue paint; faded by well over a century of sitting beneath tons of rocks. And then it happened. Letters began to appear. 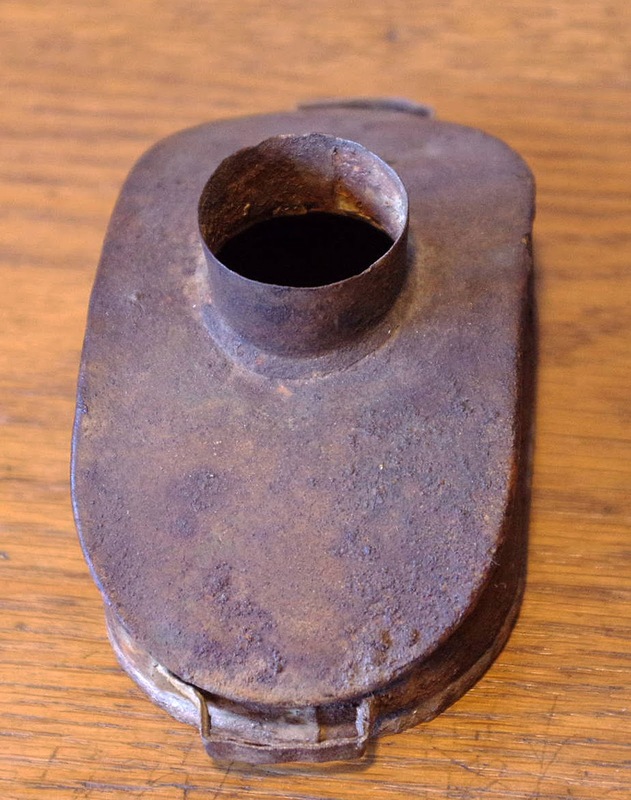 Once reassembled, the flask slid into the lower half like a glove, and the upper half slid snugly into place over the lower. 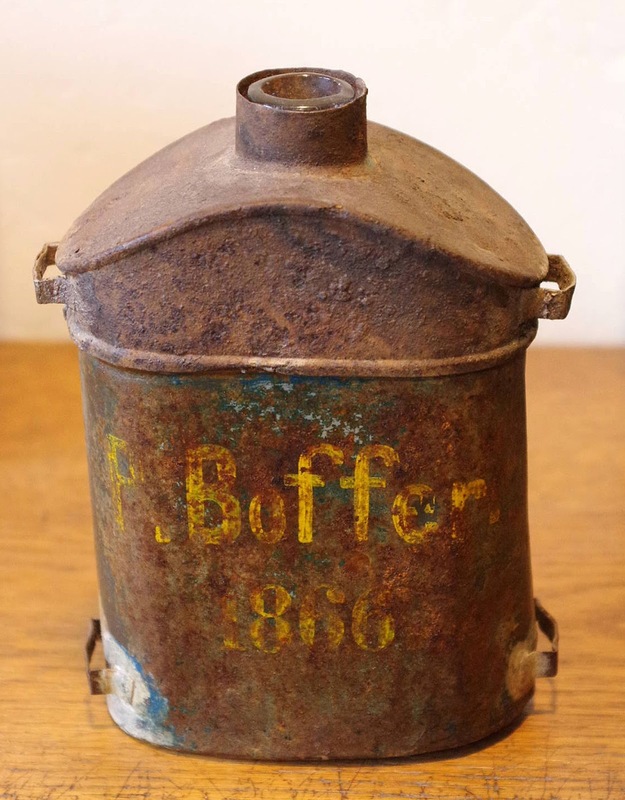 The question begs though; Who was P. Boffer, and why did his canteen end up deep inside a mountain of hand stacked rocks in the bottom of a frozen canyon in the wilderness? Countless weeks spent in research have yielded not a shard of evidence to solve the mystery. No records in census, no death records, no records in Southern Oregon, no records of Civil War Service. Nothing / Nada. And so the Gold Rush era mystery remains. Excellent Bruce, it was like I was there with you. What a killer find. 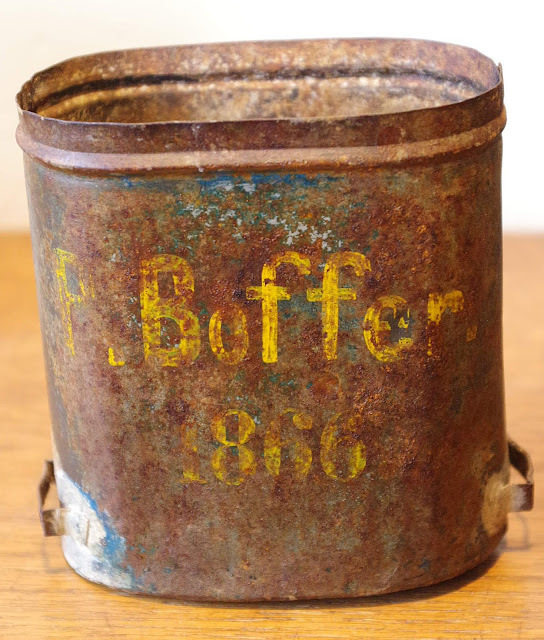 I guess we will never find out who Boffer was. Bruce - Is it a two piece canteen and lunchbox? No, it is strictly a canteen. No lunchbox. The bottle was obviously commissioned by the firm that manufactured the canteen, as it is an absolutely perfect fit, and was found in direct context to the bottom half. The wool sleeve would have cushioned the sides against the metal. It had slid out of the base when the top came off. I’m assuming that the loops on the sides of the two part base and top were designed so that a canvas or leather shoulder strap went through each. Removal of the top portion allowed easy removal of the flask from the metal portions for refilling. 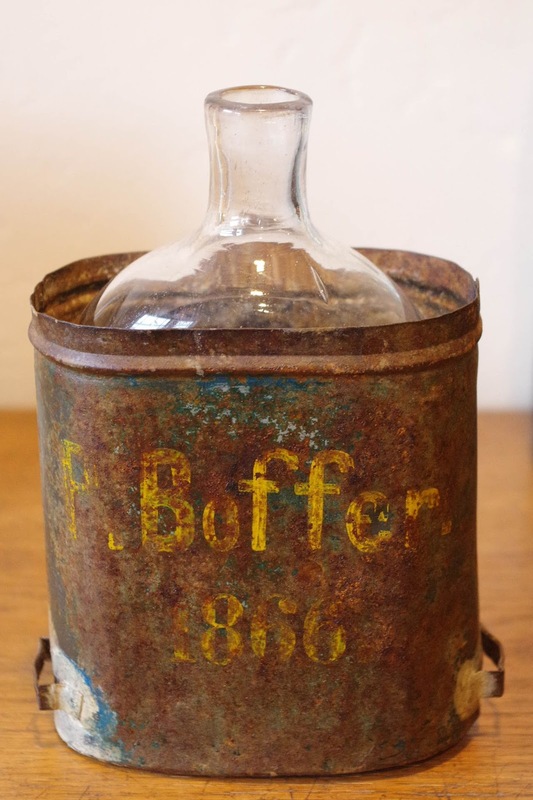 The only other conjecture that I have is that Boffer, or whomever was the user at the time it was lost, had taken the top off to remove and refill the flask with creek water, and succumbed to some type of problem. The canteen was forgotten by the other miners, and it was back to business as usual. It was then buried by the succession of after the fact hand stacking. Thanks for the explanation. I didn't realize the flask fit inside the metal container. For some reason I thought the flask was a separate find and not related to the metal container. Wow! how amazing to find the whole canteen on two separate trips to the site. Really good stuff.